Work on the South Portland Street Suspension Bridge began in 1851, but after the masonry towers had been completed and the main suspension chains erected, the south tower split from top to bottom. Extensive repairs and renewals were carried out in 1870 and again in 1926, but the masonry towers built in 1853 are the oldest surviving elements in Glasgow’s Clyde bridges. This entry was posted on October 14, 2013 by Noeleen. 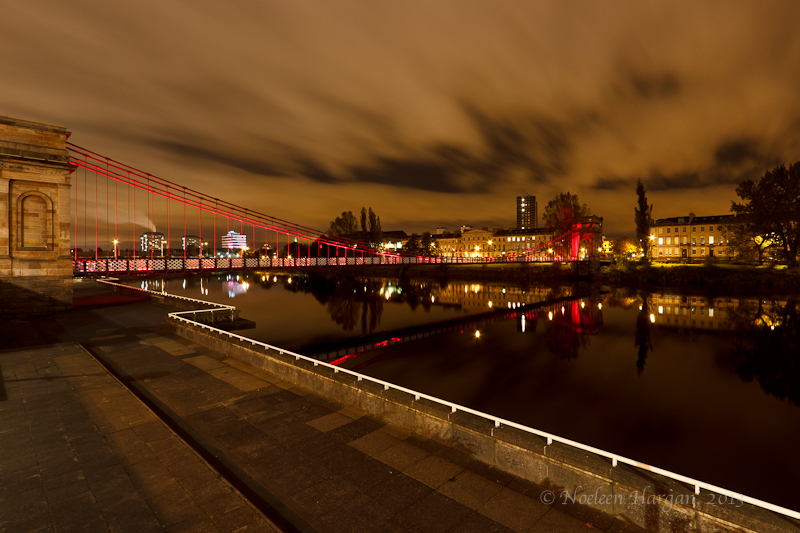 It was filed under Photography, Scotland, Travel and was tagged with bridges, Glasgow, River Clyde, Scotland, South Portland Street Suspension Bridge.